Education for Rural People: Bringing agriculture to the dinner table: How culinary education and raw foods of good nutritional quality can play a role in promoting well-being and global health. Prof. Philippe POUILLART, PhD, Senior Lecturer, Food & Health LaSalle Beauvais University (France) introduced the topic of the seminar. The seminar was attended by 60 people. It was presided by Dr. Cedric Dumont, Dr. Roberto Volpe. Several members of the IDTGTTCD and of the ERP partnership attended and actively took part in the following debate. They took the occasion to establishing contacts for possible collaboration with the Beauvais University, and by doing so they strengthened our existing partnerships. 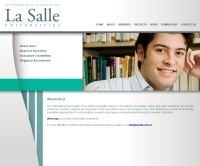 The LaSalle Beauvais Polytechnic Institute is a member of the international LaSalle Universities Network (http://www.lasalle-ialu.org/about.php) and of the ERP Partnership. It is involved in agriculture and food industry issues linked with wellbeing and health. Since 2010, Dr Pouillart’s research team is working with people who are affected by cancer treated by long-term chemotherapy. He teaches cooking courses during which he also studies patient’s reaction to the food offered. The team observed that food choice and cooking practice changes according to the radio-chemotherapy side effects developed, preferring natural farm products, which appear to be “good to eat and good to think”. This regional research program (in Picardie, France) has allowed understanding the need to help patients to prevent cancer treatment-induced side effects, and offer training workshops to contribute to reboot with overall wellbeing. These standardized workshops have been designed using cooking as an educative tool. Some are dedicated specifically to patients and their families; others are dedicated to the various clinical staff members who play a role in supporting patients through the hospital/home pathway. This experience has revealed that eating raw or lightly processed foods appears to be helpful in the control of symptoms of disease. This finally highlights the educational value and the lever-effect of use of certain types of food as own-knowledge and empowerment for a population in good health (young people particularly), as well as to improve overall wellbeing for people affected by disease, burnout, age and poverty. It is important all the more as the obesity epidemic in western countries to focus on bad dietary habits.